Next, I will try to explain the AP item description part 2. Since we picked up items related to mana last time, we focus on other major AP items this time. By the time we finish watching this article which is a little boring, it should surely be able to change the item build flexibly! Maybe! There is no one who thinks "I only get AP 60 and it is not strong ..."! Is it? The good place of this item is where you can give MR 60. In addition, the material "Negatron Cloak" which has 40 MRs is strong. I will talk a bit confusingly, so beginners can hear it. The MR of this game Mid AP Mage is almost 30 fixed. About 40 in the rune. Assuming that the other party is wearing the MRPen runes, it is roughly about 35. 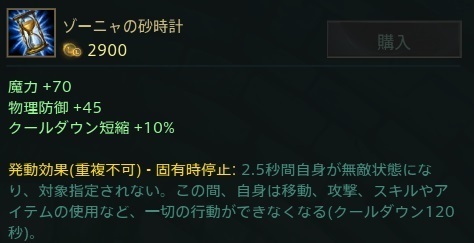 The AP damage reduction rate of 35 MR is about 25%, the damage reduction rate exceeds 40% if 75 MR (when "negatron cloak" was loaded) damage ratio. 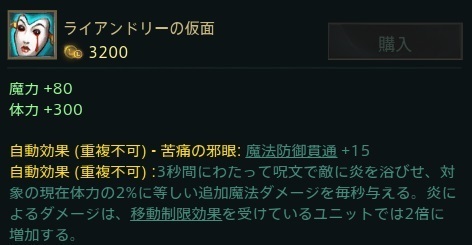 In other words, if you pay 720 gold it will damage 15 to 20% as well. In the case of a face-to-face champion aiming for a kill with a powerful combo, let 's accumulate' negative tron ​​cloak 'in priority over anything. Since there is no need to complete "Abysal Ceptor" soon afterwards, mana can have a tight campaign such as "Morelonomicon" etc. Is it a little manaki? In fact, it would be a good idea to purchase another "Dranling" and make "Abysal Ceptor". Anyway, the one-male opponent is completely different just by having "negatron cloak". Even if the opponent is not a strong one-mage Mage, it is an item that should be absolutely accumulated when feeling that it is higher than himself or when he / she got a solo kill and it is likely to feed. Feeding without feeding the MR and saying "the other is too strong", it does not change from being naked and going out and saying "it's too cold outside." 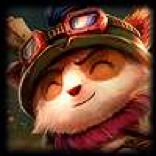 There are lots of evil champions in LoL, so let's load it for the time being if you feel a crisis even in the other face to face. The feature of this item is that it raises AR 45 and has a "special time stop" of a special special Active effect. 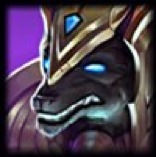 Raising for 2900 Gold The AP is modest, but it would be worth it if you can successfully use this Active. As I explained the strength of the armor by sourcing my mouth a while ago, let's refrain from saying the same thing in the column of "Zonia's Hourglass". Here I will tell you another thing that is useful. In LoL "fixed value AR / MRPen is more effective as opponent AR / MR is lower". Equipment with a fixed value MRPen is about "Sorcerer Shoes", "Mask of Ryan Dolly" and its material "Sad mask", but there are quite a few items that have a fixed value ARPen so-called "threat" . You already understand? If you have an AD Assassin that places a lot of threats on your opponent, please load it absolutely! I have already told you that when there was a champion who threatened the opponent. If confrontation is so it would be nice to be loaded first. Also, please pay for the champion who works effectively as "Active Hold" as the Active effect. For example, when Zed 's ULT is done, it will not be killed if there is' a special stop'. It is an item that sticks to Lucks which decides a combo from snare (Active invocation possible), ULT of Fiz which slow determination of damage is slow, Cathusu, and snare. Well, since items are pretty much counted for two items than defense, we will go better from here. Since this MRPen (penetration through magic defense) is not a fixed value but a penetration at a rate, damage will be passed to the opponent who is loading many MRs.
For example, even if you penetrate 15 ("Sorcerer Shoes" or "Ryan Dolly's Mask") with a fixed value to the partner you are stacking, 135 will remain, but Void staff will penetrate 52.5. "Sorcerer shoes" It is for 3-4 pieces. It is amazing. On the contrary, it only penetrates 10.5 for those with MR 30 only. Since there are reasons like the above, I hope I can buy it at the time when Tank's MR items come together. Is it about the third item? If the opponent's Tank has not loaded MR at all, the fourth or fifth one is OK. It is easy to understand because the effect is short. The cost is as much as 3800 gold as many APs go up. A price that is hard to put out a hand a bit ... · · ·. In order to make use of Passive's "increase magical power by 35%", please buy it in the middle stage, the final stage when AP items come together. Even if you buy it without the AP going up there is no special effect, so efficiency is bad. When the opponent's Tank does not have MR, it becomes a candidate as the third item. When you are loading, please buy "Void staff" for the third and buy "Rabadon Death Cap" after that. One hundredAP items that can be bought at 3200 Gold, one on attack. If you hit a skill with the charge accumulated, it gives a good sound and damages the surroundings. Mana is enough, please buy yourself when you do not have a champion that threatens your life (you do not reach yourself). If you have, buy the first two items of this article to buy one. Due to additional damage, damage efficiency is simply an excellent item. It is also useful for minion processing. 100 AP items that can be bought at 3200 Gold Part Two, Defensive. In addition to raising your physical strength by 400, you give Slow effect to your opponent when you give damage with skill. It is a useful item that you can use to escape and follow. 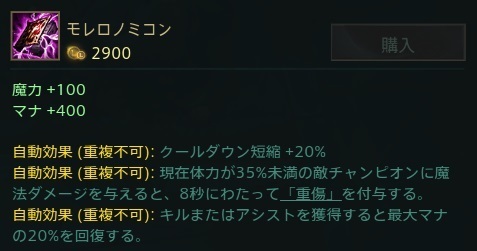 Since it is information of PBE, it is not certain, but the change is due to come in 6.24. 100AP and physical strength 400 also increases, Passive is also excellent, and it is often adopted as the second item of champion (easy to apply low CD skill possessing) which is easy to activate passive. It is hard to choose as the first item because you can not have mana. Also, it is strong to be a champion who has hard skill shots but strong skill shots. If you get some skill it will draw a slaw, so let's go looking for a powerful skill shot there. Especially effective scenes are when Kite easy champions are complete. That is when you have multiple Melee champions. It is quite possible that Mage vs. Melee can win if you buy "Reelai Crystal Scepter" and shoot the skills while winding down. In that case, let's positively accumulate. Next time I will introduce AP items that I could not introduce here. Well look at those who are interested!